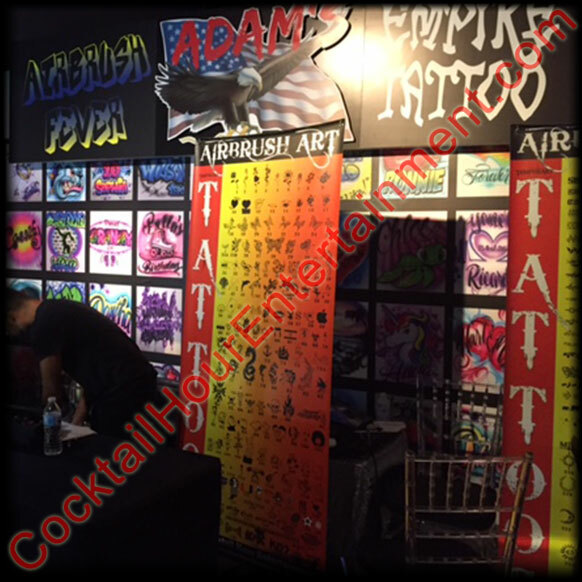 Cocktail Hour Entertainment provides airbrush graffiti services for the cocktail hour at your Bar Mitzvah, Bat Mitzvah, Corporate Event, Wedding, Sweet 16, Quince, or other Special Events. Our services are available for just 1 hour or for the entire party. 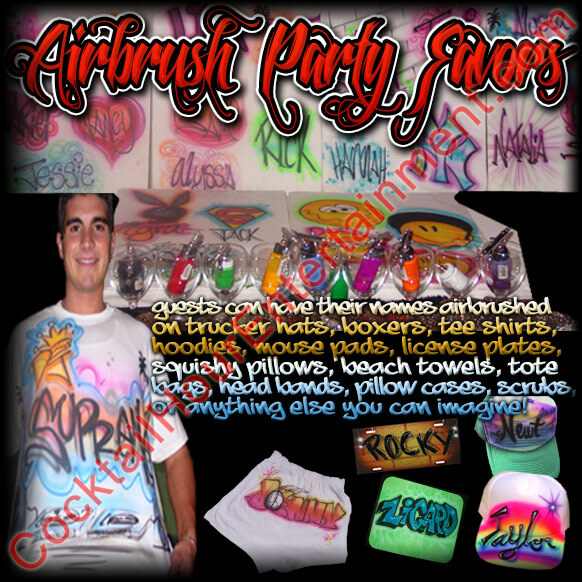 We provide Airbrush Party Favors (AirBrush Shirts, AirBrush Pillows, AirBrush Boxers, AirBrush Hats, etc....), Arcade Games, Arcade Machines, AirBrush Tattoo Artists, Air Hockey Tables, Baseball Speed Pitch, Basketball Pop-A-Shot, Bead Factory, Black Jack Tables, Bling Station, Bubble Hockey, Bubble Soccer, Caricaturist, Digital Caricaturist, Carnival Games, Casino Tables, Circus, Claw Machine, Cotton Candy, Craps Table, DDR Dance Dance Revolution, Dance Heads (Boogie Bodies/ Pop Noggins), Dog Tags, Photo Dog Tags, Fantasy/Fake I.D. 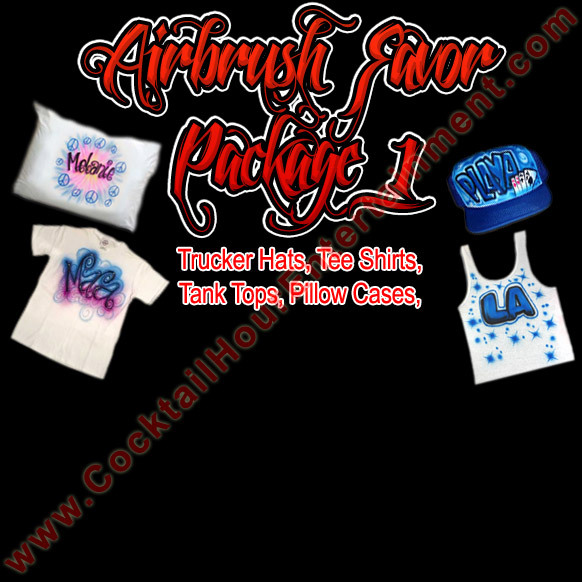 Cards, Feather Extensions, Flip Books, Foosball, Foam Dance Pit, Football Toss, Fun Foods, Giant Board Games, Giant Operation, Giant Twister, Glitter Tattoos, Golf Challenge, Graffiti, Green Screen Photos, Guitar Hero, Gyroscope, Hair Feathers, Hair Tinsel, Hollywood Photos (Red Carpet Photos), Hose Hockey, Jukebox Rental, Magazine Covers, Money Machine, Movie Posters, Multicade, Pinball Machines, Phone Cases, Photo Booths, Photo Favors (Photo Novelties & Green Screen), Photo Keychains, Ping Pong & Ping Pong Table (4-Player), Poker Tables, Pool Table, Popcorn Machine, Prize Wheel, Pucker Powder (Sandy Candy), Rice Jewelry, Rock Band, Rope Ladder Climb, Roulette Wheel, Skill Crane, Sky Dancer, Slot Car Racing, Slotless Car Racing (Microreality), Soft Pretzels, Sno Kones, Sport Games, Sublimation Favors, Surfboard Simulator (RoboSurfer), Sumo Suits, Tattoos, Velcro Wall, Video Game Systems, Wax Hands, Xbox Arcade, and much more!